Prosperity Marketing System is a funded sales funnel for network and affiliate marketers. Started in 2009, Prosperity Marketing System has evolved into a very effective income system with a generous 100% commissions payout plan. The updated system builds your subscriber list and funnels people into your primary business or product offer. It also includes a series of training courses, focusing on safelists and traffic exchanges. 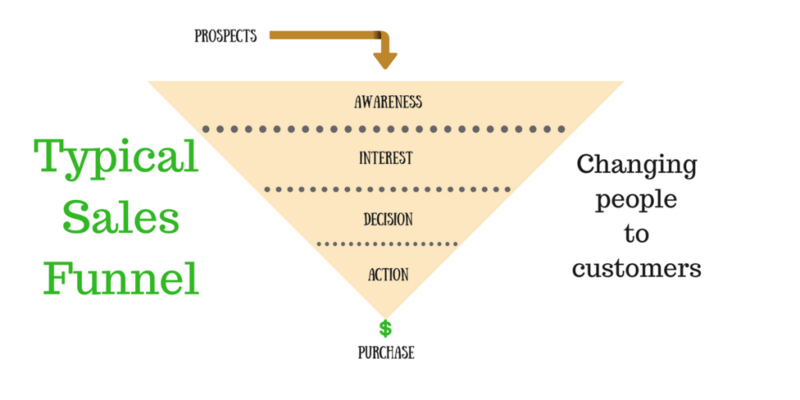 What is a funded sales funnel? The purpose of a sales funnel is to change prospects into customers by providing solutions to problems. A typical “sales funnel” is a system to generate, qualify, and close leads through the sales process. It is called a funnel because when shown graphically the top is the largest population (leads), and the bottom is the smallest (closed deals/new customers). The Prosperity Marketing System enables a member (student) to generate commissions by promoting the system to others. As the student generates sales, the student may upgrade to owner to get additional funnel functionality. The primary upgrade is the ability to add their own business to the funnel. This results in more visitors and sales from their primary business. The following flowchart shows the progression from someone needing a sales funnel to owner. A Tour Taker is given free access to the system to explore how the system works and assess whether or not they want to continue to the Student Phase. I was a member of Prosperity Marketing System (PMS) years ago. But I did not stay because it just did not fit my needs or my wallet. Typical of pre-built downline builders and sales funnel systems, there was no flexibility in the individual marketing programs within the system unless you upgraded. It was take-it-or-leave it. I thought the upgrade to the “Owner” level was too expensive for most beginning marketers, including me. So I left. But Darren Olander made a number of major upgrades to PMS including a major pricing structure change. The Prosperity Marketing System (PMS) is quite simply an easy and complete list building system. I have seen many since I first started marketing online in 1996. Even people new to home business marketing and network marketing can use PMS effectively and greatly benefit from it. The purpose of the Prosperity Marketing System sales funnel is to promote and generate leads and prospects. The following short video provides a quick overview of PMS. The Prosperity Marketing System is comprised of training courses, income builders, personal branding, affiliate center, and customization section for Owners. Basic Essentials which covers Basic Computer and Basic Internet tutorials including videos. Prosperity Marketing which includes introduction to downline builders, autoresponders, how to use a splash page builder, and the importance of advertisement tracking. Traffic Generation including viral list mailers and safelists and how to use traffic exchanges. Solo Ads are very briefly covered. The Primary Business promoted is the Leased Ad Space which I recently reviewed. List Builders. Six list builders are included and all can be modified or changed to the member’s personal preferences. Traffic Exchanges. Six traffic exchanges are included and all can be modified or changed to the member’s personal preferences. Other resources. Five sponsor recommended resources are included. Any or all of these may be changed to the member’s personal preferences. Joining any of these programs are optional. The personal branding section provides several ways for members to promote and build their businesses. Included in the personal branding section are the autoresponder, custom tracking, follow-up, splash page builder, splash page tutorial, and rotator management. The affiliate center provides pre-made graphics and email swipe files, headlines, downline information, and more to help members manage their PMS business. There is the customization section for Owners. As you can see further down the page, Owners have the greatest flexibility in changing PMS to suit their business needs. Prosperity Marketing System has three levels of membership. Tour Taker. Tour Taker is free and enables the tour taker to check out the system and use the splash page builder to create landing pages. A tour taker cannot earn commissions or access the training. Student. A student can create landing pages, receive 100% commissions on new signups, access training, integrate any autoresponder, integrate any tracker, customize (add or remove) 15 affiliate programs, and use same primary company as their upline. Student membership is $12 a month. I am at the Student level. Owner. An owner can edit any training page within the whole system with their own content, create their own training pages to show to their downline referrals, change their primary business to any company or program they like whenever they want, and replace the autoresponder and ad tracking programs if they prefer something else. The Owner Add-On is a $97 one-time purchase to further customize the owner’s system. They must be subscribed first to the Student membership to purchase this add-on. Members earn 100% commissions on all sales except their 2nd and 4th which are passed to their upline (sponsor). Their referrals or any sales passed to the recruited member will also pass up their 2nd and 4th sales to the member. This is huge leverage, you just need to get the ball rolling! The following is an overview of the PMS compensation plan. Ready-made funnel system – The Prosperity Marketing System is an out-of-the-box ready marketing system. Members start promoting their business from the first day. Customizable – PMS is flexible and allows members to change the income builders to their choosing. The Owner Add-on provides the most flexibility. Training – Ideal for people new to online business building and network or affiliate marketing. Complete funnel – PMS enables members to generate leads, signups, and sales from a single site. PMS email follow-up system – PMS sends a series of follow-up messages to tour takers on behalf of members. Should a tour taker complete the series of emails without signing up as a student, PMS enables the member to make a final offer into another program to the tour taker. Training focuses on traffic exchange and safelist email for promotions. PMS is in a highly competitive niche, “make money online.” So there are many competing funnel systems available. However, many do not have the longevity of PMS. Hopefully, this Prosperity Marketing System review has provided an overview how important it is to have a system in place for success in internet marketing and home business arena. 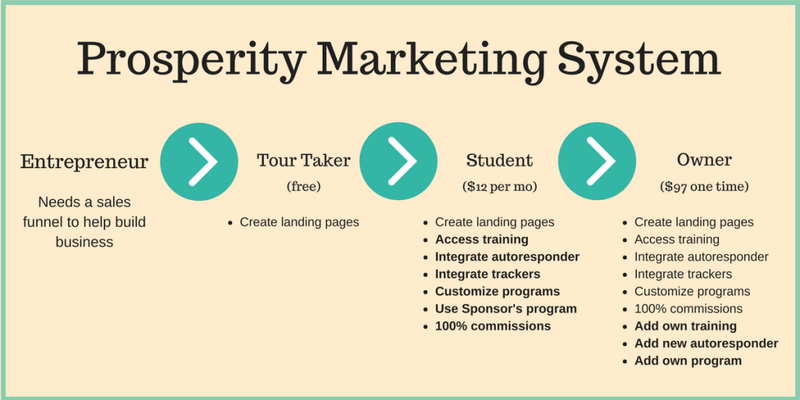 The Prosperity Marketing System makes it easy to build an list while creating multiple streams of income. Absolutely the Best Way to Build Big Customer Lists! That’s how I first came across the concepts of both MLM and funded proposals. The thing about MLM is that it can be a costly game, and you’re bound to be out of pocket quicker than you can be in profit. So I can see why you opted out of Prosperity Marketing System. However, PMS appears to offer some “OK” training and income builders. But traffic exchanges would be a no go area for me because I’ve never had success with them. And that was back in the late 90’s lol. But I do like the fact that there’s a sales funnel and an email follow-up system included. Prosperity Marketing System can be a great opportunity for those who are looking into MLM/Network Marketing. Thanks, Neil. Great comment! I also have Mike Dillard’s Magnetic Sponsoring stuff from years ago. Buying the “Owner” add-on would be a way for someone to build their PMS sales funnel leading to Wealthy Affiliate as the Main Business. You are right about traffic exchanges. I saw a forum post earlier today from a person who owns a number of traffic exchanges and safelists. He has extensive tracking data that shows how ineffective advertising on one of the largest traffic exchanges really is. He indicated it takes 62,000 hits to generate 1 sale or sign up. Thanks for this review of Prosperity Marketing System Glen, you have given a great breakdown of how it all works. I like how this program is giving you some decent training, but to be honest, I am not really sure of this type of business model. It seems to me that to make any money you are making is just by on selling the same “system” to others, but what actually is the product? I think I would prefer a business model like affiliate marketing, where you can get a slice of selling actual products. John, thank you for the comment. I appreciate you taking the time to read and comment. Your comment is very helpful. I realized that my explanation of the Prosperity Marketing System (PMS) was insufficient. So I added two charts with additional explanation. Prosperity Marketing System is essentially a sales funnel system much like ClickFunnels (CF)and other funnel marketing systems. Both CF and PMS have affiliate programs enabling members to earn commissions from the sale of the respective sales funnel systems. However, there are several major differences between PMS and CF. First, CF has templates available for its members to create landing pages. PMS does not (just the landing page creator). Second, CF monthly cost is much higher than the monthly PMS cost. The PMS upgrade to owner is a one-time cost. Third, CF has a 14-day free trial period. PMS has a free unlimited trial period (tour taker). While the free tour taker has limited functionality, the landing page creator is available for use and the tour takers can see the entire program. Thanks again! I have seen that the program uses traffic exchange marketing strategy. I was told that this is not a really good idea to monetize the list you look forward to building. I have also seen many people complaining that people who give upon their emails are not happy with a program that gives out their emails for promotions. I wanted to leverage this system to generate leads, bit I don’t think I will use. Do you know another program that is similar but more ethical and effective? Hi Dave. Thanks for commenting and raising several issues. Yes, I have heard that traffic exchanges are not a very good way to get traffic or monetize your list. Many marketers consider them “bottom feeders” of the internet marketing world. But if you are in the “make money online” (MMO) niche, traffic exchanges should be considered. Here’s why. SEO and content marketing used to generate traffic to your business is passive. You are waiting for visitors to come to you. If a business is not generating traffic passively, then they should go out and get it. Social media marketing, per-per-click, email marketing, traffic exchanges, classified ads are all used in the MMO niche. I would not take any off the table. Regarding email addresses, the prospective email address goes to the company AND the affiliate who promoted the product. It goes to no one else. The thing about providing email addresses is that companies ask for customers’ email addresses. I bought a Ford truck last year. They asked for my email address. Now I get email from the dealer as well as the Ford Corporation. Also, last weekend I ordered pizza online from Domino’s. They asked me for my email address. Same thing when I shopped at Staples for office supplies last month. They asked for my email address. No one asked me for my Facebook info or my Twitter account. I use a number of Google gmail accounts depending on the subject. I have email accounts for ads, newsletters, info, personal, and other business. If I see something of interest and they ask for an email address, I will use the info email address. If it does not interest me, then I will unsubscribe. If it is something I want and continue with the company/person, then I may change my email address to a different account. There is nothing unethical about businesses asking for email addresses. It is an effective way to build subscriber lists. But if you are looking for alternative sales funnel systems then there are ClickFunnels, Unbounce, LeadPages, Instabuild, OptimizePress, InstaPage are a few alternatives. Thanks again. Hope this helps. Hi Glen! Thanks for this review. I really learnt a lot! Not only on prosperity marketing system but also on sales funnel itself! I liked how you wrote it very comprehensively at the same time easy to understand. I have a question though Do you think it would fit someone with little to no experience in the current market? As I want to try it but not sure if it may be too complicated for me. If not, can you recommend other programs that are targetted for beginners? Thank you for your comments. For someone with little or no experience, I suggest they focus on building their website and adding content. Assuming you have a website. As they say, content is king. At this point, I recommend reading Pat Flynn’s Smart Passive Income blog. He has lots of info on affiliate marketing. He does many podcasts as well. One of recent podcasts covered marketing funnels. Thank you Glen for a very sensible review of Prosperity Marketing. I came here looking for more info before trying PMS. You have done that exceptionally well without gushing with a lot of hype! I think I will give it a shot! i like your seemingly laid-back style, You a “Southern” boy? Thank you for you kind words, Gerald. I have been living in Virginia the last 20 years. But was born and raised in Oregon. I am already a Student in PMS. I have 54 tour taker, and only one student. First, I used Bing Ads to promote which is by far super easy to do and I got immediately 28 subscribers. I tried traffic exchange and raised my tour taker to 55. Until now, only one is a student. In this niche, I think, sustainability and longevity is the key to success. Be consistent in promoting PMS to generate leads and sell your own product. Planning to upgrade as Owner later. Though I have only one student, my purpose of PMS is to generate leads for me. Not primarily to earn big bucks but to promote my business inside PMS and have a training course too. If anybody who is about to purchase PMS, my advice is to have a different perspective. Use PMS in generating and promoting your own business (which I think is the best way to profit from it). Nowadays, its hard to compete online with MMO niche and IM stuff, however, PMS is a great tool to do this for you. And thank you Glen. Your blog helped me decide to go PMS. You are welcome, Lloyd. I appreciate you taking the time to provide a comment. The recent changes to PMS has made it a flexible tool for us to adapt to changes in the MMO niche.